6:30 a.m. and we were all at breakfast; we left the Hotel Rosario about an hour later. 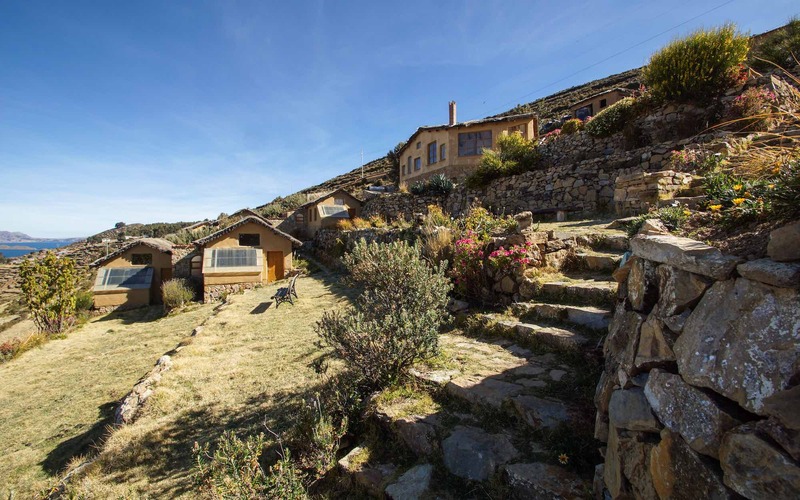 Our destination – Isla del Sol and the Ecolodge La Estancia. 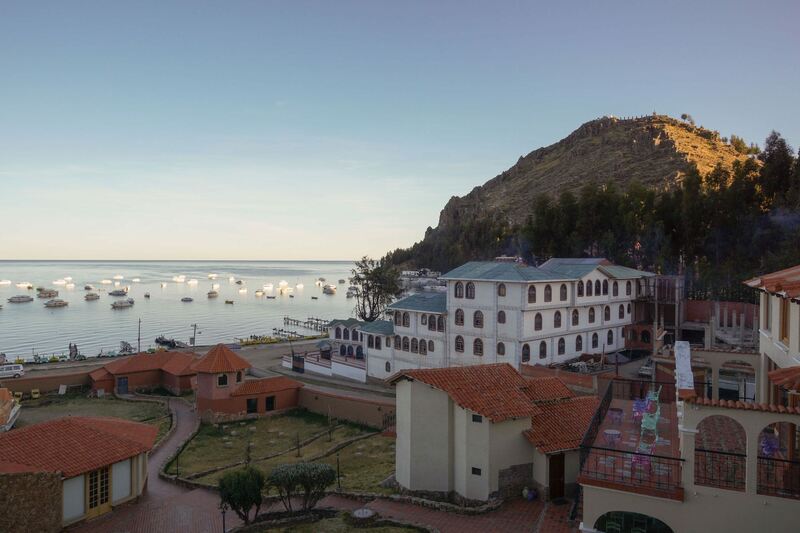 Most visitors to the island that figures so prominently in Inca myth will take a boat from Copacabana itself for a day tour while a few will stay overnight on the island and return to Copacabana the next day in the afternoon. same as above – portrait mode! Our approach was a bit different. 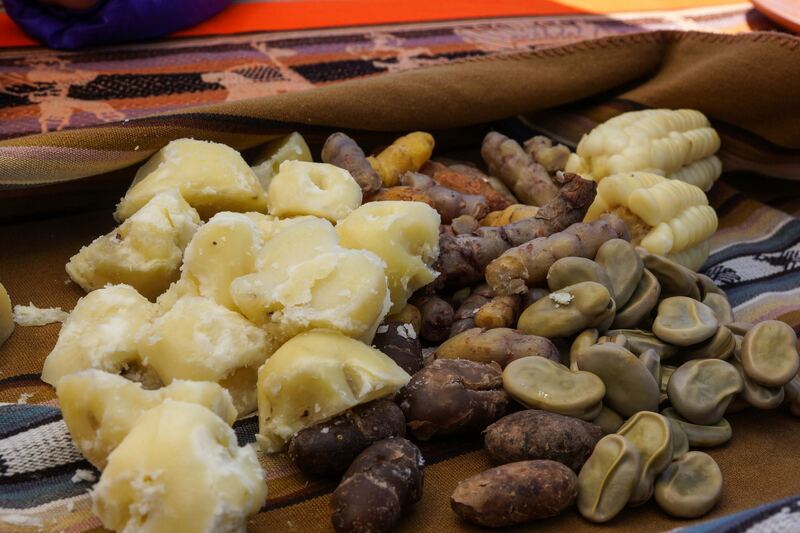 Like those pilgrims in the Inca world, we made our way along the coast to Yampupata. 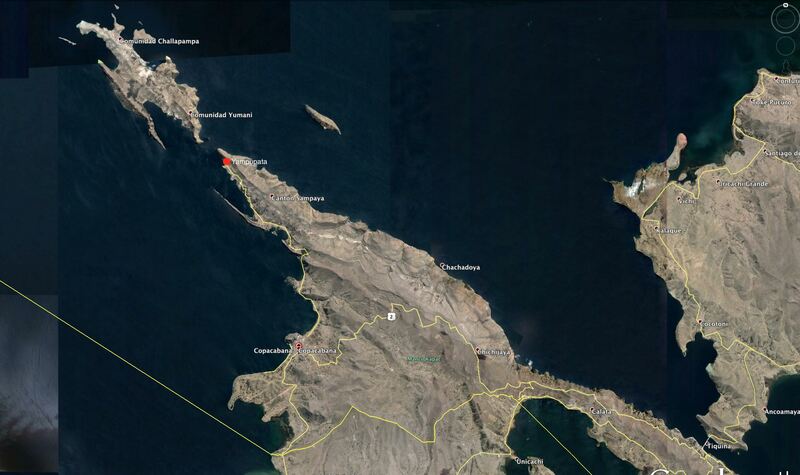 It is a small communidad seventeen kilometers from Copacabana at the tip of the peninsula across from Isla del Sol (see map below). 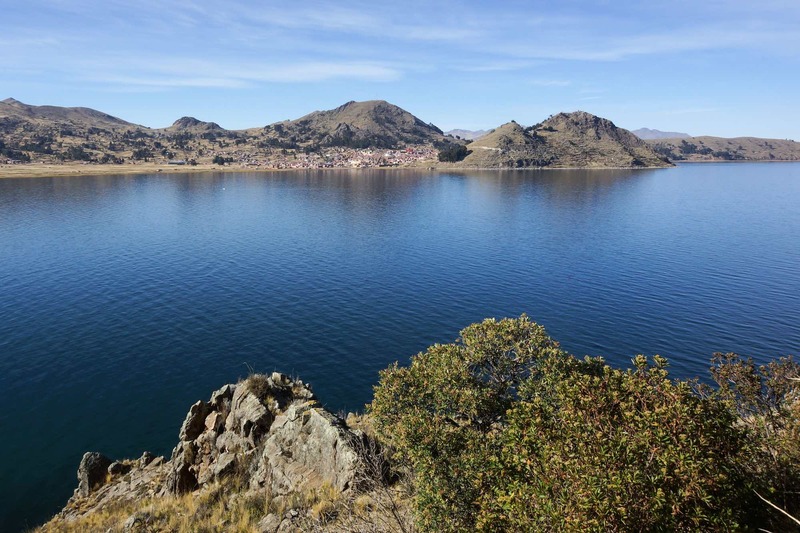 It would have been from here that pilgrims would take a raft across the strait to the south western tip of Isla del Sol and begin their walk to the temple complex and the Sacred Rock (the Titikala) at the other end of the island. A boat would be waiting there to take us across to the island. From there it is a 3.5 kilometre boat ride to Yumani harbour. 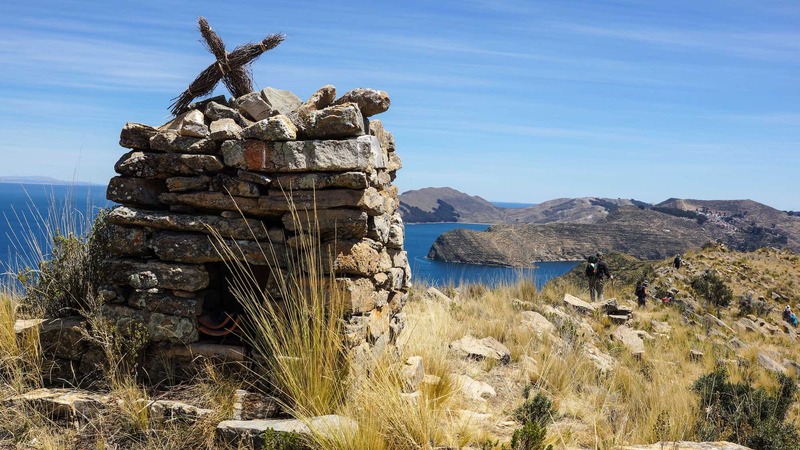 A tip to those planning to stay overnight on Isla del Sol: if you have lots of luggage, it would be best if you did not bring all of it along. If you can’t carry it yourself, leave it behind, taking just what you need for an overnight stay. The rest can be stored in the hotel at Copacabana where you spent the previous night. 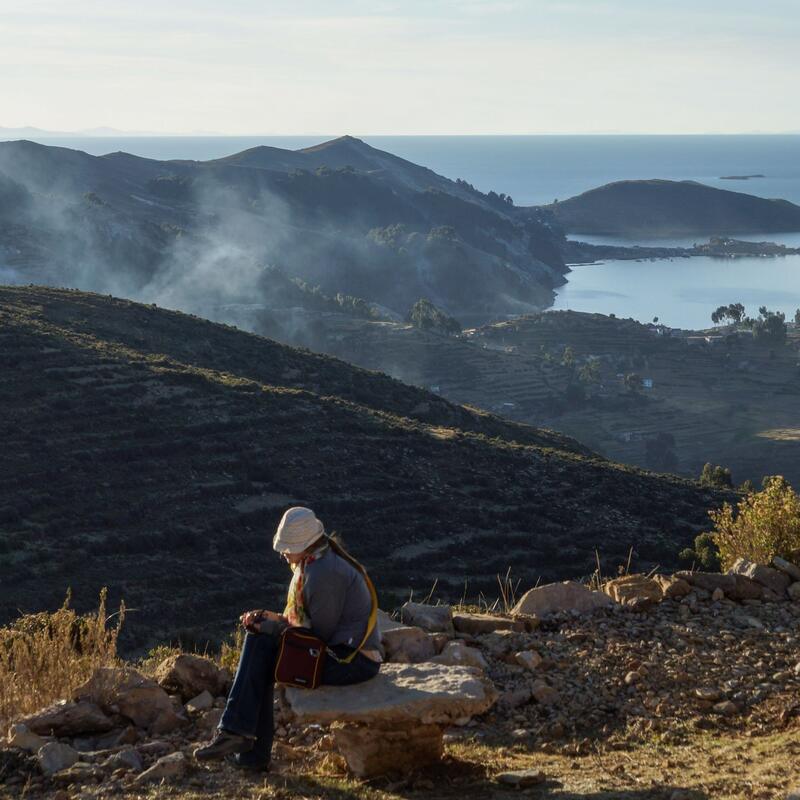 I watched an elderly German couple arrive at the Ecolodge with perhaps 40 kilograms of stuff each and then saw the poor donkeys who had hauled their rigid and heavy suitcases up the steep path from the shore. The couple was understandably winded after their hike up the hill. I felt for the donkeys. The ride on the gravel road from Copacabana is quite scenic. The road itself is narrow and the few times a vehicle approached from the other direction some co-operation was necessary! The attempt at a panorama below was shot from the top of the bay just north of Copacabana. 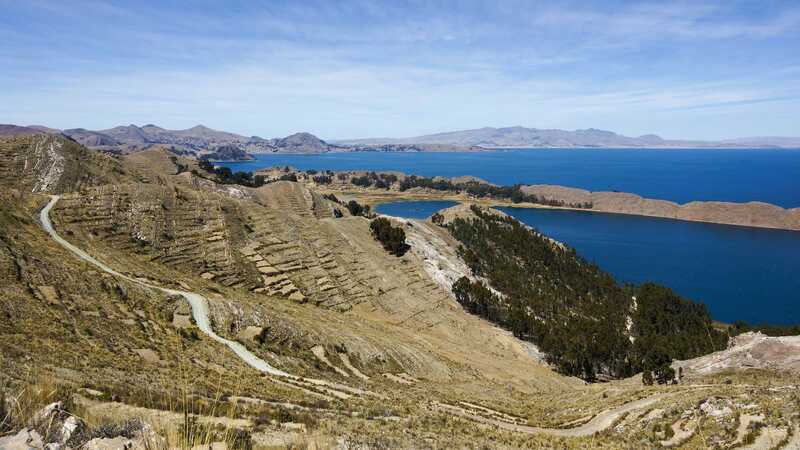 Before I had joined my small tour group I had considered doing the visit to Isla del Sol on my own. 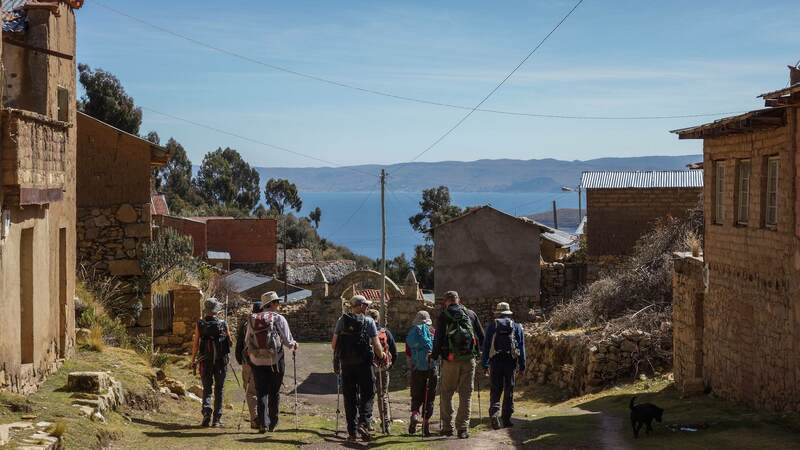 Wanting to do what Inca pilgrims had done, I planned to walk the seventeen kilometers from Copacabana to Yampupata and then catch a boat over to Isla del Sol. While the scenery is undeniably eye-catching, having seen the road I am glad to have been spared the experience. After 9:30 it gets very hot – and walking on a shadeless road with vehicles coming by and stirring up dust gets old pretty fast. 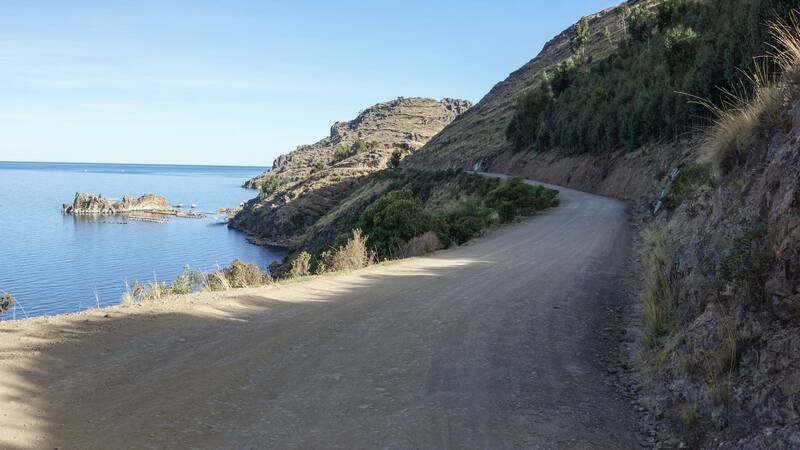 Better to save your time and energy and use it on Isla del Sol where you can walk from one end of the car-free island to the other on a pedestrian-only trail with similar views. If you are still keen on doing the walk, an early morning start (6:00 to 6:30 a.m.) would be advisable. Keep that backpack light! Back to my small trekking group – to get our first bit of walking in we did not drive right to the boat launch area at Yampupata. Rather, we got out just before the village of Sampaya (see the map below) and spent a very pleasant two hours walking the five kilometers along a ridge trail used by villagers with great views of the lake and the islands. No vehicles whizzing by, no dust to inhale, no rush – a nice way to spend the morning! Above is a stretch of the road as it comes from Copacabana on the top middle of the photo. The photo below, taken from the same spot, shows the rest of the road as it heads to Yampupata on the right. 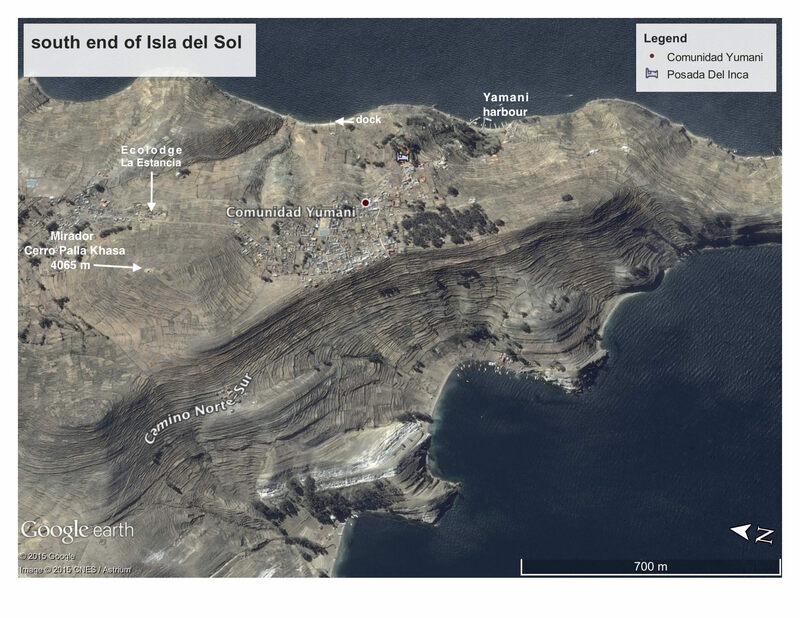 Already visible is Isla del Sol. Always there when we looked east was the Cordillera Real, the Royal Range. 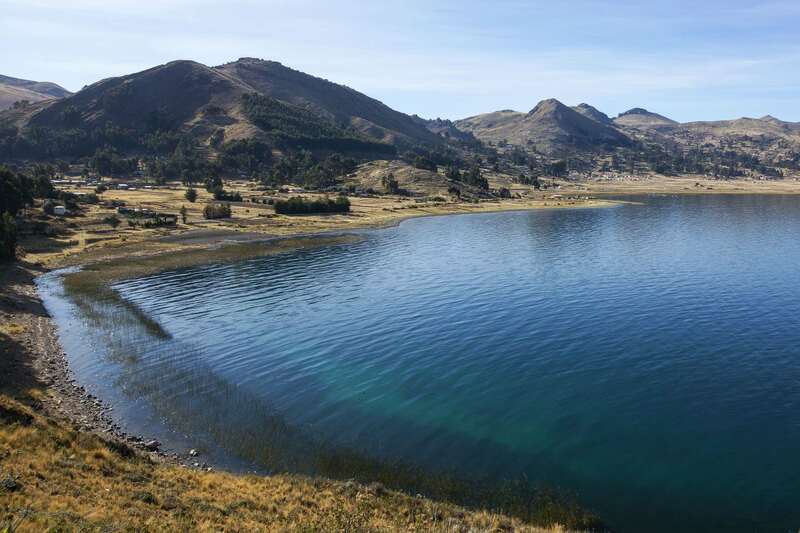 In two days we would begin our two-week trek down the mountain range from Illampu at the north-west end to Nevado Huayna Potosi some 110 kilometers south-east. 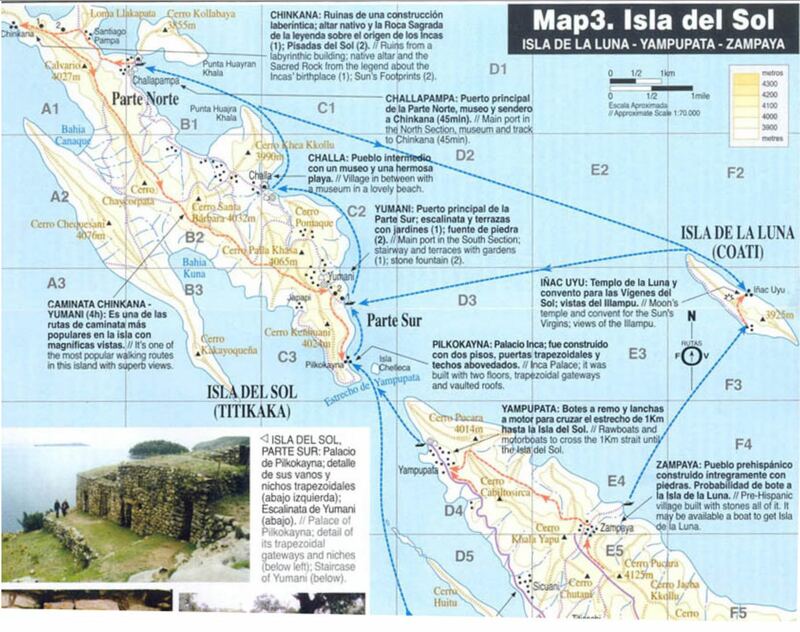 In the photo below you also see Isla de la Luna, another island significant to Inca myth that we would visit before our trek. There were a few boats at Yampupata when we got there, including the one that Javier our guide had contacted the day before. One of benefits of being a member of a well-organized tour is how little time is wasted at transition points like this. 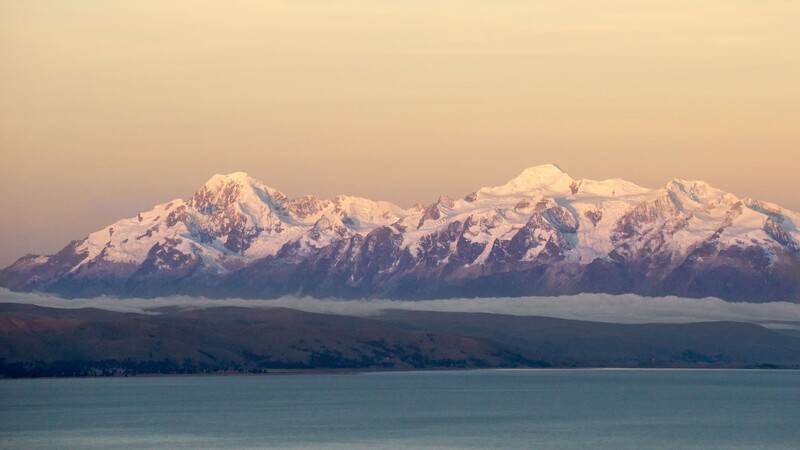 Throughout the three weeks of our Andean-Summits-organized trek there would be many instances where we would marvel at the clock-work efficiency of it all. It makes the seemingly steep price worth it! We took the above boat over to the island. 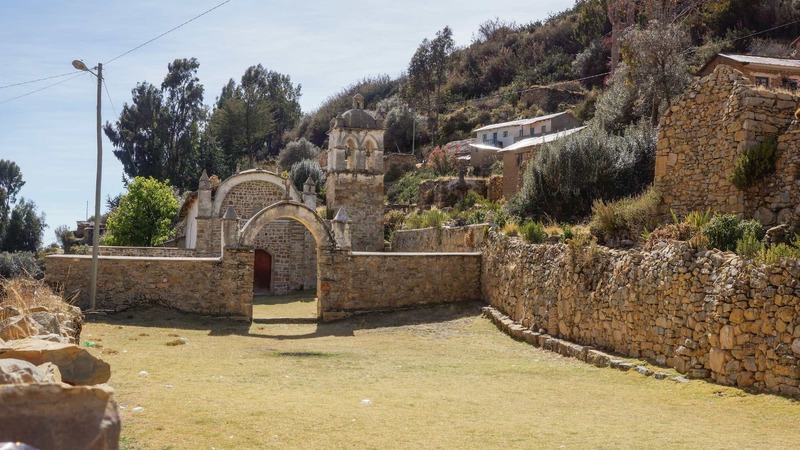 Pilgrims in the Inca world would have rafted over to the nearest point on the island and then would have started their walk to one of the most sacred spaces in the mythic world of the Inca, the Titikala or Titi Khar’kha, the Rock of the Puma, the very place of creation. I did not know it at the time, but our boat passed by the stretch of shoreline where the pilgrims of old would have disembarked. 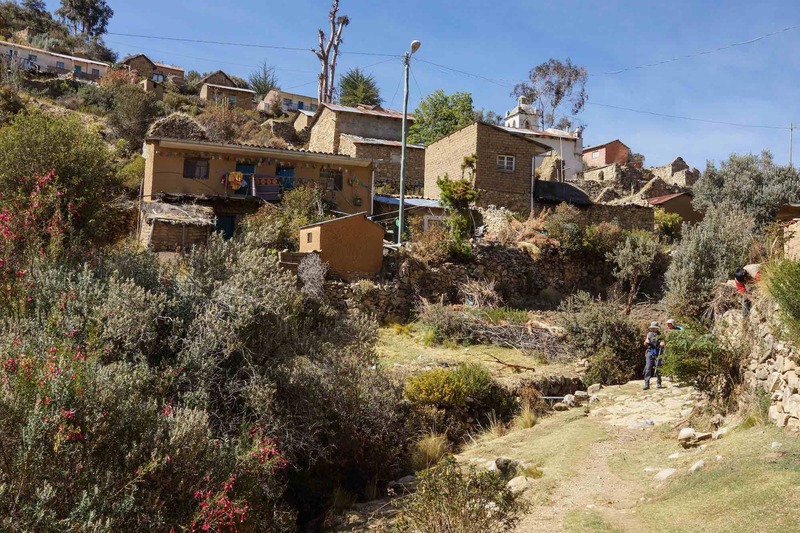 Walking along the shoreline past the Pilco Kayma (also spelled Pikokayna), all that remained of their journey was a final ten kilometers to the mythic Inca place of creation. Our approach would be a bit different. 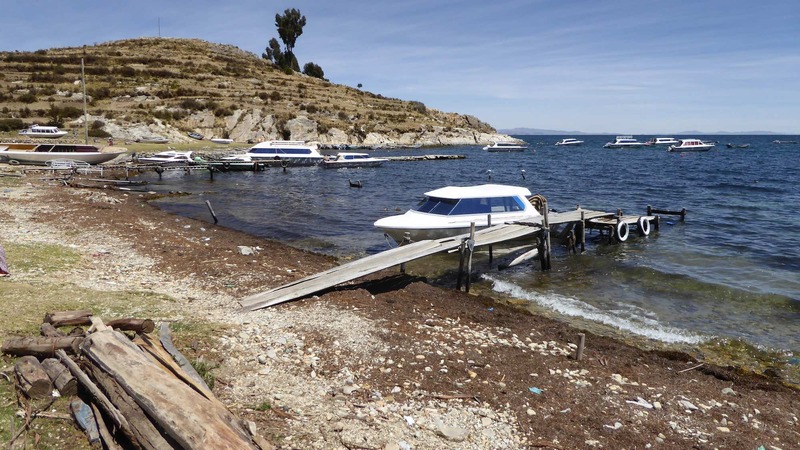 A 4.5 kilometer boat ride and we were walking up the dock to the Isla del Sol shore. 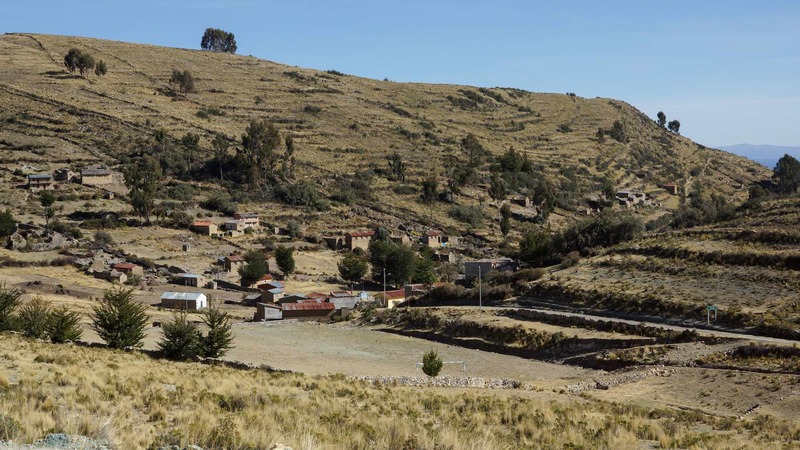 We did not land where the Inca pilgrims had or even at the Yumani village harbour. 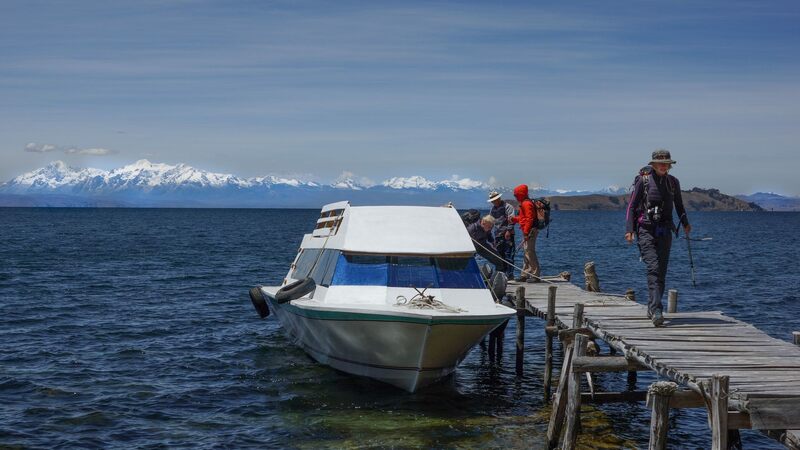 Instead, we headed a little further south for a dock near the shoreline restaurant where we would have lunch before walking though the fields up to the Ecolodge La Estancia. We only had our day packs with us – the rest of the luggage Javier had arranged to be kept in storage at Yampupata. Lunch was a simple affair. The assortment of veggies below is what I worked on; the non-vegetarians – i.e. everyone else – had, I think, some chicken along with the various types of potatoes, beans, and corn that I nibbled on. I was still recuperating from the stomach problem that had laid me low a couple of days before so I don’t recall eating all that much of what you see in the photo below. The photo ops, however, were stunning. 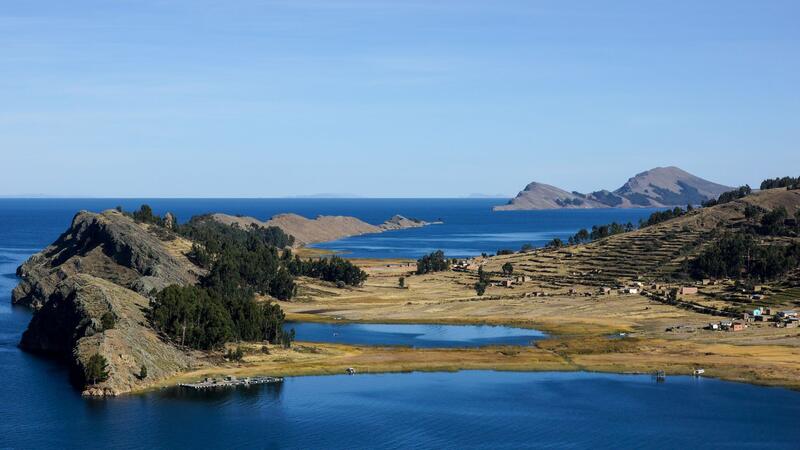 Below you see Lake Titicaca, the red-tinged tip of Isla de la Luna, and the north end of the Cordillera Real with Nevados Illampu and Janq’uma prominent on the left side. The distance from our lunch table to the mountains? About seventy kilometers (44 miles)! 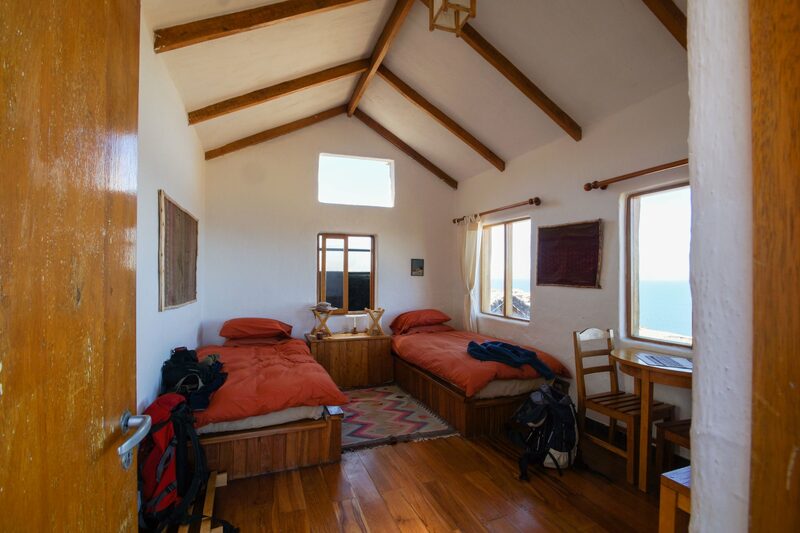 Our accommodation for the night was the Ecolodge la Estancia. I gulped when i saw the price of the room on the tripadvisor website – including taxes, it is in the $280. U.S. range per night! This does include dinner and breakfast if that makes you feel any better. 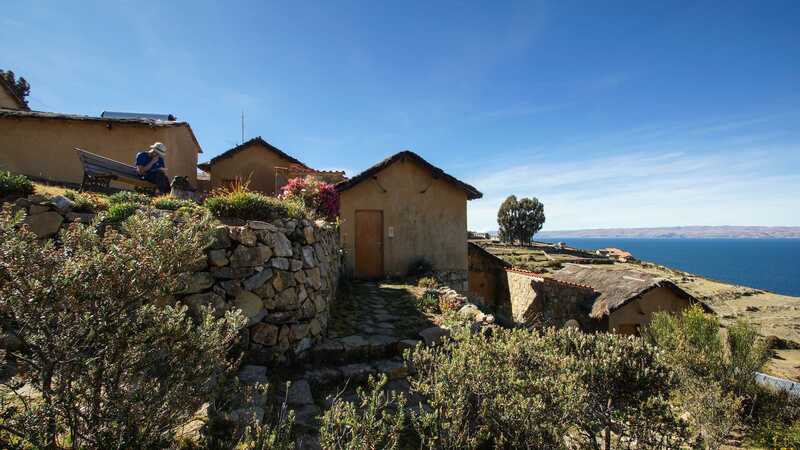 Click on this tripadvisor link here to see a full list of Isla del Sol lodging. You can definitely do much cheaper. I’ll admit that the Ecolodge with its attention to details and service made for a delightful stay. 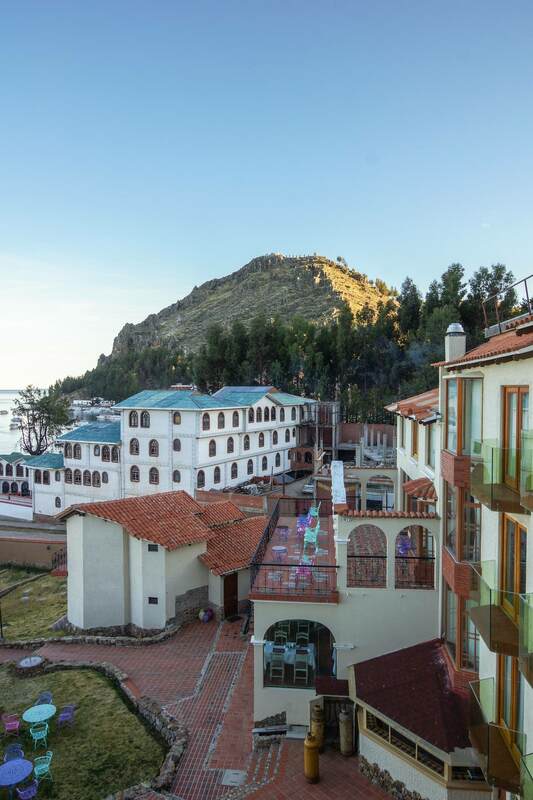 Along with the excellent transportation arrangements and overall degree of organization, the quality of the hotels we stayed in help explain the cost of the trip. After taking our orders of that evening’s dinner, our group went for a walk to the island’s high point. 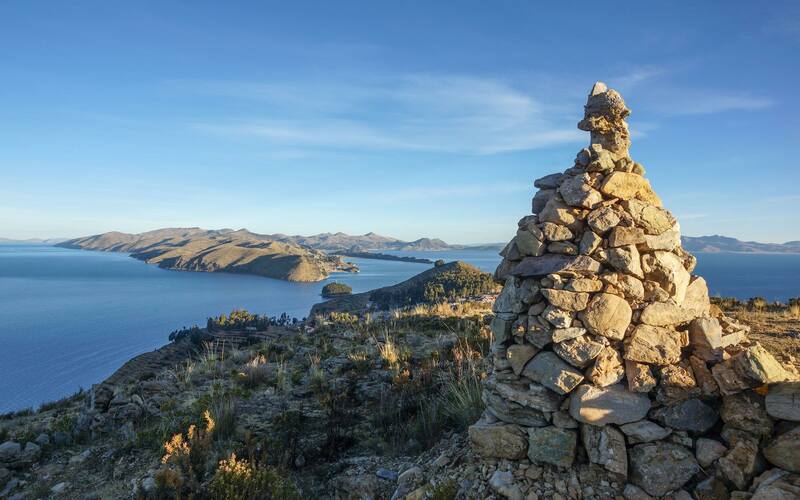 On topographical maps it is labelled as Cerro Palla Khasa but most local people apparently just call it Mirador (Viewpoint) La Estancia. We got there in maybe thirty minutes by zigzagging our way up though the terraced fields. There is another path from the Yumani that get to the top from the other side. It was definitely worth the effort! 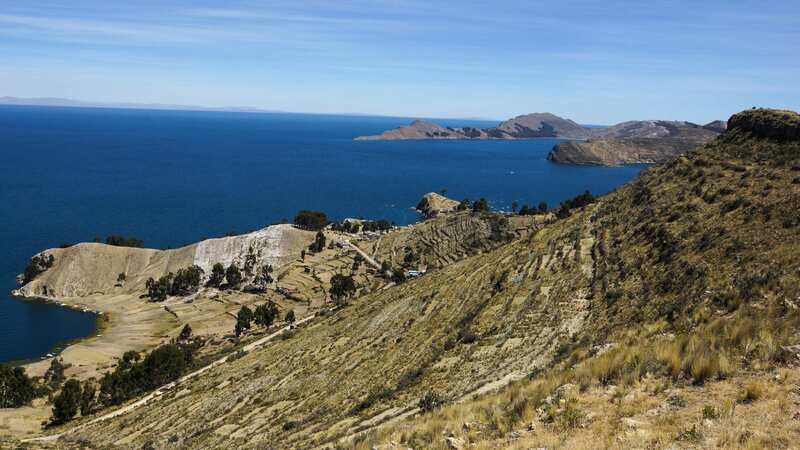 Visible in the above photo is the village of Yumani on the north end of isla del Sol. 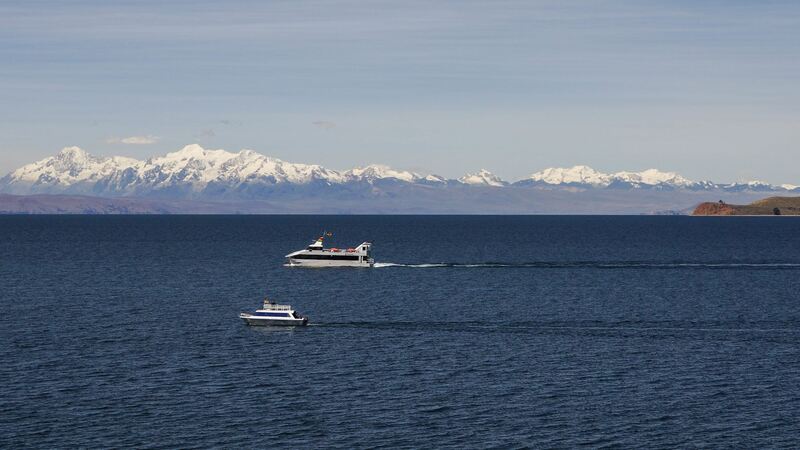 In the strait is the Isla Chelleca and behind it is Yampupata harbour. 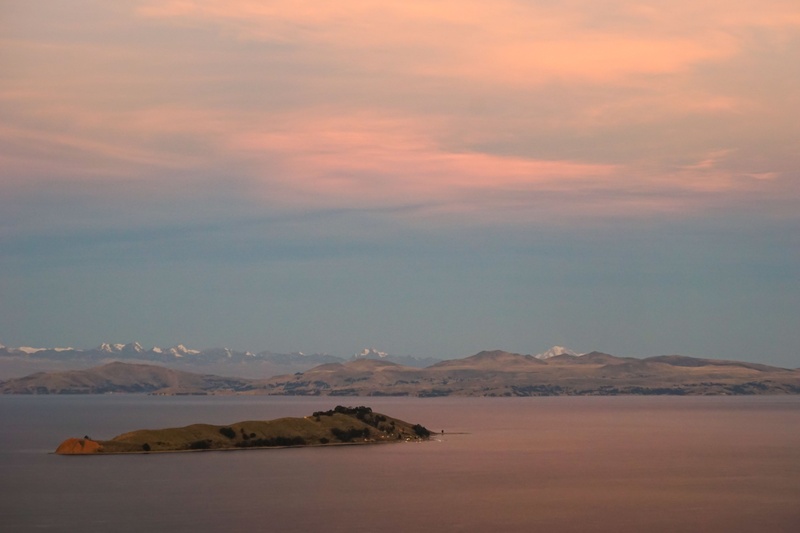 Copacabana, eighteen kilometres away, is visible on the far shore of the lake. 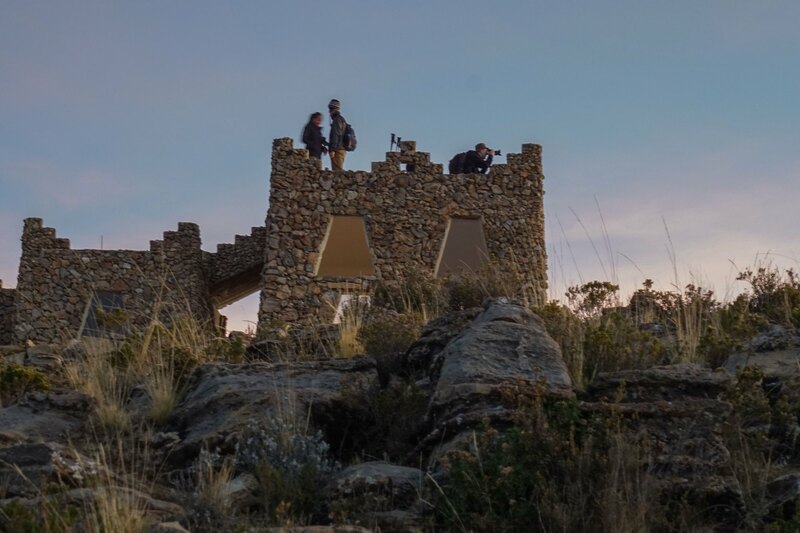 We stayed at the Mirador La Estancia (Palla Khasa) until dusk, entranced by the changing colour of the sky as the light fell. Then it was time for an excellent meal down at our home for the night at the Ecolodge. Great read 🙂 I didn’t know the distance between Copacabana and Yampupata is 17 kilometres! That explains why I only made it to Titicachi… Yep, you’re right, walking on that shadeless road was pretty tough! 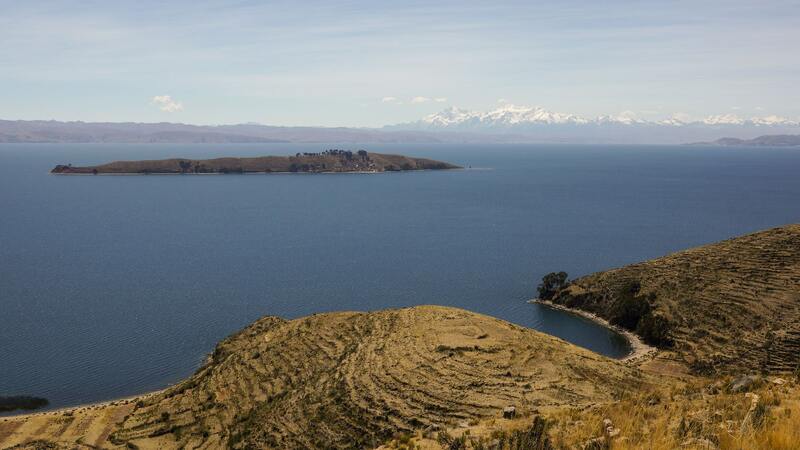 I’m sure glad I met a few school-aged boys in Titicachi who rowed me across to Isla del Sol. That was such an amazing experience… But it sounds like it would have been nice to get to walk the ridge trail from Sampaya to Yampupata! You have to have earned some bonus points for taking on that walk! On the plus side you did get to meet Willy and his bro. You sitting in that row boat without a life jacket – yikes! That’s some big water you crossed. Being completely looked after, I certainly did not have the adventures you did.